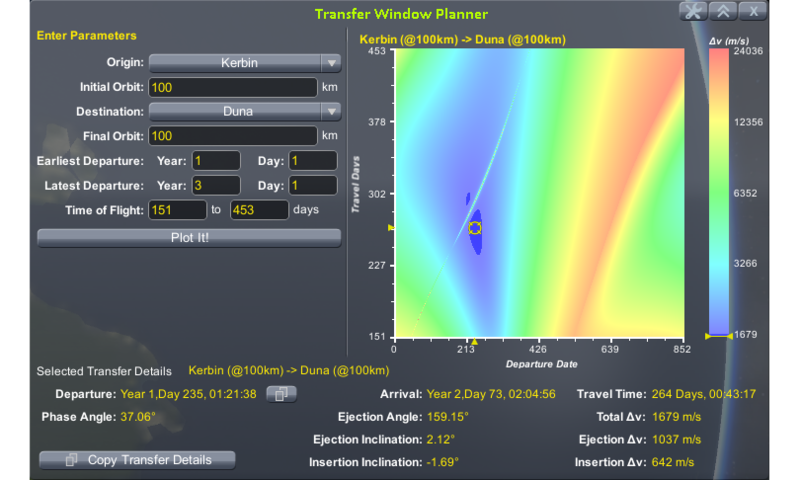 The Transfer Window Planner is a plugin to let you visualise planetary transfer efficiency in-game. Using it you can select your planet of Origin and planet of Destination and it will present you with details about the required Delta-V to travel from Origin to Destination. You access the tool by clicking on the Porkchop icon in either the AppLauncher or Common Toolbar - your choice - then follow the instructions in the main window. Once you have selected a transfer you can use the Copy buttons to copy that text to any other plugin or window. It will once a day download this page http://triggerau.github.io/TransferWindowPlanner/versioncheck.txt to read the current up to date version number. Interesting. Would this work with MJ's maneuver planner? So just to answer a few questions - maybe before they get asked . That will be very useful! Thxs in advance Less switching between KSP and the browser is always good. Awesome. I have been wanting an in-game version of the launch window planner for a while now. Glad to see it finally happened. Nice. This is something that really needed to be in-game. Glad you got ahold of Alexmun and made it happen. Great tool to have in-game! Awesome job, but unfortunately this causes terrible performance issues. While the mod is installed I'm limited to <1 fps in any view. Can't wait to try this out in-game! Unfortunately, i experienced the same performance drop, though not that bad, sometimes fps dived to 15~. Awesome job btw, UI feels crispy and looks gorgious! One thing that i didn't like (or find) is ballistic/mid course drop menu, and precise delta v readings like normal/radial/prograde etc. I shall download this, play with it, and then determine whether I actually need it to do my launch windows. My guess is no, but still... SHINY. Might be integrated in Kerbal Alarm clock but I also have to report a slighlty performance drop, when looking at my moonbase the timer went from green to yellow with mod installed. [Edit] The only thing I can think of offhand after having a look at the code for 5 seconds is that you perform several InputLockManager.GetControlLock() calls every frame whether or not any windows are open. I don't know if they are expensive (on certain hardware/drivers) but if they are it might be worth setting/clearing flags to keep track of the locks instead. Great mod, thanks! Used it this morning for the first Duna transfer in my new career save, and it worked perfectly. I like it more than some of the other transfer calculators, because I don't always want the most "optimal" - sometimes I'm willing to give up dV for a better date, or a shorter travel time, and having the full surface plot really makes that easy. No noticed performance issues on 32bit KSP, Win 8.1. My install is heavily modded (right up to the limits of 32bit). If I were to make a small suggestion, it would be to include more info in the "copy transfer properties" button, such as the dV needed, or to have it call Kerbal Alarm Clock to set an alarm 1d before the selected transfer window. Awesome to see something like this done finally. Just a heads up you need to make any network connectivity opt-in rather than opt-out. I've tested it and it's pretty neat. I do eagerly request that you implement the "no insertion burn" feature and the ability to pick a different transfer type (e.g. ballistic, mid-course plane change) available in the online version. Those annoying red strips in the middle of the transfer windows made it harder to plot nice trajectories. spookydonut: Nope. Read the rule. It applies only to mods that upload personally-identifiable information, which, as the OP explains, this does not. Version checkers and the like are specifically excluded by Rule 6. Awesome mod, very sleek. My only idea would be the ability to plot transfers to Asteroids orbiting the Sun as well as Planets. I was having some serious performance issues with this. In flight, launch, or space EVA, it's fine no noticeable changes. But was doing an EVA on Ike and it was so slow that I could barely control the Kerbal. Once I removed this mod things were back to normal. KSP 32 bit, fairly modded, Win 8.1 x64, 16 gb ram, nvidia GTX 560Ti, i7 3770 if that all helps any. Does it happen whether or not the window is open? The mid course correction requires more maths that might be over my head - am planning to look in some spare time. The precise DV Readings I have to shamefully admit I forgot to write em to the screen, but did collect em. Will be an easy fix, but next version sorry.